Your ticket collection represents a lifetime of great memories. From your first event to your favorite one to the best seats you ever had; each ticket oozes with details. Just one look at them and the stories come flying back. The road trip, the parking lot, your traveling companions … so many memories. So where are your tickets? Good question. In a shoe box? In a closet? In a junk drawer? Bad answers. A Ticket Album is the perfect item to display your entire ticket collection in just one album. Get them out of storage and into a book specifically designed to fit tickets. It’s time to not only cherish your memories but it’s also time to share the stories. Your friends and family will love them. 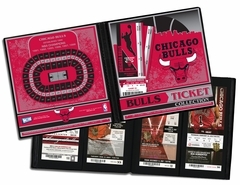 A Ticket Album also makes a perfect gift for sports or music lovers.